HARD HITTING DETROIT LIONS FORUM - View topic - Why is everyone so mad about Ebron? Why is everyone so mad about Ebron? Re: Why is everyone so mad about Ebron? I think Taylor Lewan was actually the best player on the board when the Lions drafted (I had him going #6) - the Titans who didn't need a tackle took him with the very next pick. Are you kidding? Most draft analysts were looking at Tennessee to either go OT or DE/OLB at this pick. Their offensive tackle situation is not very promising. Roos wasn't that good last season, and exactly which Michael Oher do you expect to get? They made that pick for their future. Now Lewan can either completely supplant Michael Roos, or he understudies for a year and then takes over when they let Roos walk next year. The Lions have FAR less of a need at OT than the Titans do. I really think there were 4 players in play for Detroit at #10 Lewan, Donald, Ebron and Beckham. Taking a defensive back or linebacker with Gilbert and Barr off the board would have been a total reach I even feel the Bears reached for Kyle Fuller at 14. Lewan and Donald don't fill needs for the Lions going into this season and maybe beyond. If the pick came down to Ebron and Beckham - I'm glad they took Ebron because he brings more to the table than another undersized slot receiver. How is Beckham 'undersized'? He's a tad over six foot. That's big enough to be a starting wideout, and not necessarily just a slot receiver. It's not like he's expected to play power forward. As for not letting the clock wind down doesn't really matter. I doubt the Lions were willing to trade down below the bears and risk having the Bears take a guy they wanted. 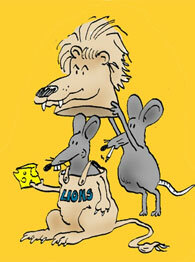 I sure the Lions talked to the Titans, Giants and Rams and didn't find any takers. It still begs the question: what's the harm in letting the clock wind down and allowing the opportunity for someone to come along with a blockbuster offer? If it doesn't happen, it doesn't happen. It's FOOLISH to shut out that chance when you have absolutely nothing to lose by doing it. Houston took longer on the clock than the Lions did, and they pretty much knew who they would be taking, IF nobody offered a huge deal to them for that pick. Even when the Colts took Andrew Luck, they burned off more time than the Lions did. As a GM of a professional football team, you always keep your options open. Or, at least, that's how it should be. What's the harm in letting the clock wind down and allowing the opportunity for someone to come along with a blockbuster offer? Plus it would have gave me more time to get another draft party hot dog. Damn Lions!!! Last edited by TheRealWags on May 19th, 2014, 4:35 pm, edited 1 time in total. Beckham is a touch over 5'11'' not 6'. He is slightly undersized for an outside receiver, but he makes up for it with good route running and decent speed. The award goes to Tennessee, which chose a player it might not be able to use in 2014. Offensive tackle Taylor Lewan slipped to the Titans at 11 after being mocked as high as the top six, and I’m always fond of teams that want to build from the lines out, but the Titans don’t have a place for Lewan to actually play right now. They just spent $20 million in free agency to bring in Michael Oher from the Ravens to play right tackle. Tennessee invested heavily in guards last year, signing Andy Levitre away from the Bills on a six-year, $47 million contract before adding Chance Warmack with their first-round pick. Lewan’s not a center. The landing point for him is left tackle, but the Titans already have a pretty good left tackle in Michael Roos. Lewan profiles as his replacement, but the 31-year-old Roos still has one more year left on his deal at a relatively comfortable $6.6 million. If the Titans want to start Lewan, they’re going to have to get rid of Roos, which they would have to do with no leverage and little likelihood of getting anything of consequence in return. If tackle Mike Otto returns, Lewan spends the year on the bench or filling in as an injury replacement, which is wasting a year of value on his rookie contract and slowing his development. And, for a team that has major holes on defense (especially at cornerback), there’s a serious opportunity cost in going best player available and drafting a tackle who might actually be a little worse than the guy he’s replacing. Lewan might end up as a very good tackle, but this was very odd timing for Tennessee. Are you kidding? Most draft analysts were looking at Tennessee to either go OT or DE/OLB at this pick. Their offensive tackle situation is not very promising. Roos wasn't that good last season, and exactly which Michael Oher do you expect to get? They made that pick for their future. Now Lewan can either completely supplant Michael Roos, or he understudies for a year and then takes over when they let Roos walk next year. The Lions have FAR less of a need at OT than the Titans do. The Titans just signed Micheal Oher and already have Roos under contract while Lewan provides an upgrade tackle wasn't as pressing need for the Titans as say defense or quarterback. I'm just pointing out that Lewan WAS the best player on the board. I highly doubt the Titans would have reached for Zack Martin at #11. Check your stats I'm pretty sure Beckham measured in at 5'11 that's not very tall for somebody to play on the outside where they generally want somebody over 6 foot and 6'2 to 6'4 is ideal - 5'11 IS undersized. I think the Lions should have done that but I'm giving you their logic in not doing that. Honestly the results would have been the same only that would have changed was your perception. Anybody out there still want to defend the Ebron pick over the Beckham pick in this past draft? m2k, I think what you missed from Rao's post is that it's odd to question whether or not the coaching staff plans to use E2 extensively. Jimmy Graham played something like 80-90% of NOLA's offense snaps last season. I thus expect E2 to see at the bare minimum 60% of the Lion's snaps. Looked to me like Green Bay got better play from their rookie TE (Rodgers - 5 receptions) than we got from Ebron (2 receptions) today. They took him at the end of the 3rd round. Where has Pettigrew gone? In last years draft anyone who has any kind of eye for talent could see we should be taking OBJ. Obviously that doesn't include Mayhew. Can't wait to see how he botches this years draft. Never have, never will. Side note, Beckham had 185 yards today. Someone wanna chime in with Ebron's season total? 23 catches for 210 yards, but that might be prior to today's game. I still think they would have been better off taking Martin over both of those guys. no AND im worried he wont be much better next season. his blocking is actually somewhat decent out in space, his ability to get open is good and he is a mismatch but his hands are even worse than advertised. i dont know that his ability to catch can be improved much unless its some indirect effect of thinking too much, etc. maybe but i ll have to see it to believe it. beckham looks like an absolute stud even if some of his numbers are padded by playing in meaningless games on a bad team. however, the TE position on this team is still important but unfortunately still in need. Pettigrew isnt a substantially better blocker than street FAs like Kellen Davis and shouldnt be retained at his price as he can no longer get open which is unlikely to change as he s turning 30. he might not be in the league more than another season or two. Fauria has also fallen out of grace with his idiotic off the field injury which everyone know s he lied about. he ll need to have a good offseason but i wouldnt be surprised if the lions took another TE either in the back end of the draft or free agency if someone becomes available. While it may be true, a guard/tackle was not seen as a big need. Nobody would have predicted the fall off of Warford, nor the injury issues we've had at RT. However, it is plainly evident that Sims is done, Swanson can fill at center, and that we need a healthy RT. Cornelius Lucas should remain a backup, and so should Waddle. Get rid of Garrett Reynolds, who was absolutely terrible today. My lawnmower would have been more difficult to push than him. Beckham or Kyle Fuller would have made more sense than Ebron. And after a years worth of play, they were better talents to boot. Ebron hasn't just not been impressive, he's been down right awful. The only thing worse than Ebron has been Lombardi. That douchebag has to go. Amazingly. Lewis was probably better. Problem with Ebron is he's a receiving TE who can't catch and seemingly doesn't know his routes. That's not a small problem. The punter has the ball in his hands more times per game than this top ten draft pick. Worst pick Mayhew has made. Cannot beat the Aaron Donald Drum enough right now. How would everyone feel about Suh and even Fairley right now if we had this guy on our team: 47 Tackles (37 Solo) - 2 FF - 9 Sacks.